Eastern Mennonite University once again set a new high for student-athletes named to the annual Old Dominion Athletic Conference All-Academic Team, as 96 Royals were honored. Last year a total of 80 Royals were named to the list, which had also been a high over the previous year’s total of 61. All of EMU’s ODAC-sponsored sports were represented on the All-Academic Team. Men’s volleyball competes in the Continental Volleyball Conference and is not eligible for the ODAC team. The ODAC All-Academic Team eclipsed 1,000 student-athletes for the eighth consecutive year and set a new high-water mark for conference honorees for the fifth year in a row. 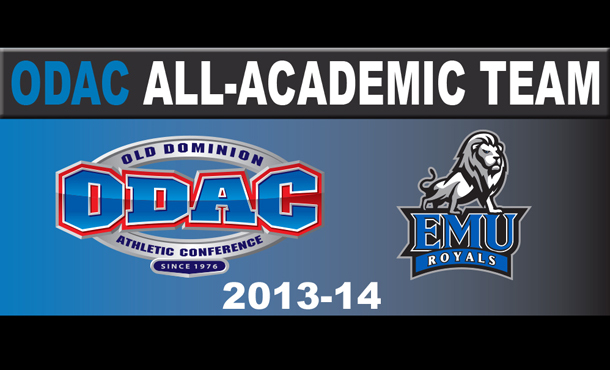 With representatives from each of the 17 ODAC institutions (including Catholic University for football only and Greensboro College and Notre Dame of Maryland University for swimming only), 1,558 student-athletes earned recognition on the 2013-14 ODAC All-Academic Team. For more information, visit the ODAC’s home on the Internet at www.odaconline.com. Don’t forget to become a fan of the ODAC on Facebook and follow @odacathletics on Twitter. Way to go Royals! Keep up the good work both in the classroom and in athletic competition!